John Riley reviews the new Tamron 10-24mm f/3.5-4.5 Di II VC HLD lens for Nikon and Canon APS-C DSLR cameras. For users of Canon and Nikon APS-C format DSLRs, Tamron has upgraded their highly successful 10-24mm zoom. Offering a “35mm equivalent” of 16-37mm (Canon) or 15-36mm (Nikon), let's see how this new updated lens performs, using the Canon EOS 600D body for this review. A wide petal type lens hood is included that bayonets securely onto the lens. This bayonet surrounds a 77mm filter thread. Immediately behind this lies the zoom ring, clearly marked and firm in operation. It is smooth enough, although lacks the silky feel of more expensive optics. The distance scale is between this ring and the thin manual focus ring, and is housed under a clear plastic window. Distances are marked in feet and metres. Focusing is down to 0.24m (9.4 inches), a maximum magnification of 1:5.3 or 0.19x. The manual focusing ring can be used at any time as there is full manual override of the AF system. The ring is much smoother in operation than the zoom ring. Placement of the manual focus ring is such that the hand has no tendency to nudge it inadvertently when zooming. Closest to the camera body we find two switches. There is the usual AF/MF switch, plus the on/off switch for the VC (Vibration Compensation) system. A benefit of four stops is claimed. Tamron has managed to include VC in this lens for the first time, and have achieved this whilst hardly changing the size at all compared to the previous model. The instructions advise to turn the VC system off when using a tripod. Weighing in at a modest 440g for both Canon and Nikon versions, the lens is quite compact. It is moisture resistant, something that has been particularly relevant during this review. There are 7 circular diaphragm blades, designed to improve the bokeh of the lens. This is also a first outing for Tamron's HLD (High/Low torque modulated drive motor) which is claimed to improve the speed and accuracy of AF. The diaphragm blades are also driven electromagnetically, now in both Canon and Nikon variants. Only certain Nikon bodies will support this. Optical construction is 16 elements in 11 groups, which include 1 LD (low Dispersion), 1 XLD (Extra Low Dispersion), Aspherical and Hybrid Aspherical elements. Tamron utilise their BBAR (Broad-Band Anti-Reflection) and Fluorine coatings. The lens is compatible with the Tamron TAP-in console, which enables a USB connection to a PC. This makes firmware upgrades to the lens possible, plus fine adjustments to the AF and VC systems. In use, the lens proves to be extremely comfortable to use and very efficient. Focusing is fast, the lens is compact and light, balancing very well with the Canon EOS 600D used for this review. 10-24mm is a very useful ultra-wide to wide standard lens, offering a powerful wide angle experience even when the APS-C crop factor is taken into account. Sharpness at 10mm is centrally outstanding from f/3.5 to f/8. It is excellent at f/11, very good at f/16 and still good even at f/22. Very impressive. At the edges, the result is very good from f/3.5 to f/5.6, excellent at f/8 and f/11, very good at f/16 and fairly soft at f/22. 15mm shows outstanding central sharpness from f/4 to f/8, remaining excellent at f/11, very good at f/16 and good at f/22 down to f/25. The edges are very good from f/4 to f/11, good at f/16 but soft beyond that at f/22 and f/25. 20mm again shows outstanding central sharpness from f/4.5 to f/8, becoming excellent at f/11, very good at f/16, good at f/22 and generally soft at f/29. The edges are good from f/4.5 through to f/16, but soft at f/22 and f/29. At 24mm the performance shows excellent central sharpness at f/4.5, becoming outstanding at f/5.6 and f/8, very good at f/16, good at f/22 and becoming soft by f/29. The edges are very good from f/4.5 to f/11, good at f/16, soft at f/22 and very soft at f/29. Sharpness has been concentrated firmly on the centre of the field, with some outstanding results. The edges do lag behind, as do apertures smaller than f/11. The lens performs better at wider apertures, so may be more suitable for low light users, or those interested perhaps in street photography. Using small apertures for maximum depth of field may well lead to soft edges. 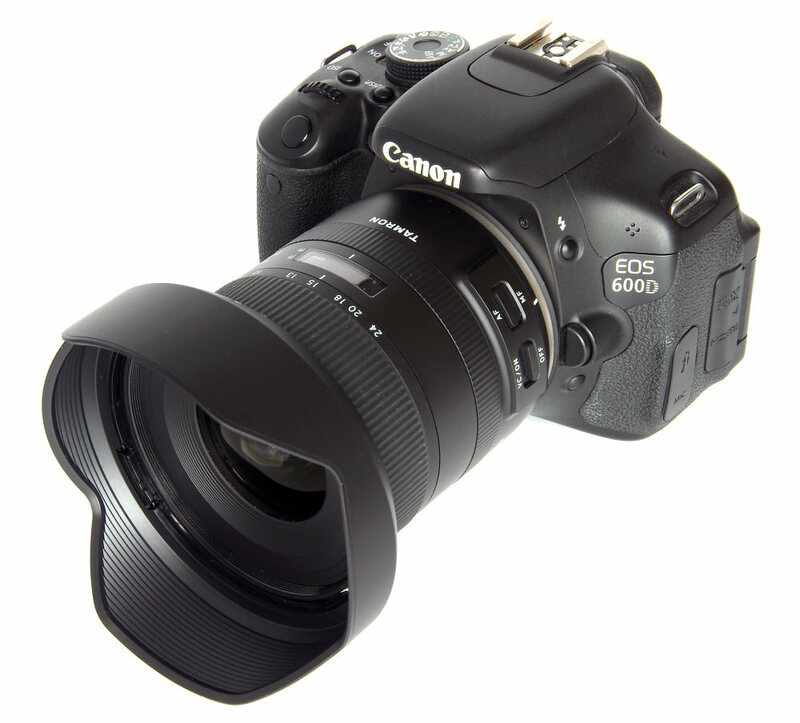 For this review, the lens was tested on a Canon EOS 600D using Imatest. CA (Chromatic Aberration) is corrected to an astounding degree at the centre of the image, at all focal lengths. The edges do display some visible CA, although this can be corrected in software. This can clearly be seen in several of the images shot for the review. Chromatic aberration (CA) is the lens' inability to focus on the sensor or film all colours of visible light at the same point. Severe chromatic aberration gives a noticeable fringing or a halo effect around sharp edges within the picture. It can be cured in software. Flare resistance is excellent and even against the light there is no loss of contrast, nor are there any artefacts visible. Distortion at 10mm is a fairly obvious -3.35% of barrelling. By 15mm this has changed to near perfect rendering, showing just +0.05% of pincushion. This does increase slightly as we zoom in, with pincushion distortion measuring +1.12% at 20mm and +1.30% at 24mm. It is controlled very well for such a wide zoom lens, which is fortunate as pincushion distortion in a wide-angle lens is not what our eyes expect to see. There is no complaint regarding the bokeh of the lens. It has a very attractive overall rendering. Likewise the VC system, which easily delivers the promised 4 stop advantage. Finally, the VC system once again is found to more than live up to its claims. Four stops are claimed, four stops can be expected without any hesitation. This may not be seen to be quite as relevant as in a telephoto lens, but will still be of value in low-light situations where the camera needs to be hand-held. The Tamron 10-24mm f/3.5-4.5 Di II VC HLD Lens is priced at £579.99, which compares with the previous version, the Tamron SP 10-24mm f/3.5-4.5 Di II LD AF Aspherical at £419 for Canon, Nikon or Sony A fit, or £377 for Pentax K fit. There are few exact competitor lenses, but there is the Nikon AF-S 10-24mm f/3.5-4.5 G DX at £729. The nearest equivalent for most marques are the 12-24mm lenses, for example, the SMC Pentax-DA 12-24mm f/4 ED AL IF (£779), Nikon AF-S 12-24mm f/4 G IF ED DX (£979), Sigma 12-24mm Art DG HSM (£1649) and Sigma 12-24mm f/4.5-5.6 II DG HSM (£649). Thinking slightly outside the box, there are also the Canon EF-S 10-22mm f/3.5-4.5 USM (£499) and the Canon EF 11-24mm f/4L USM (£2699). The latter is, of course, a full frame lens but could be used on a crop sensor. 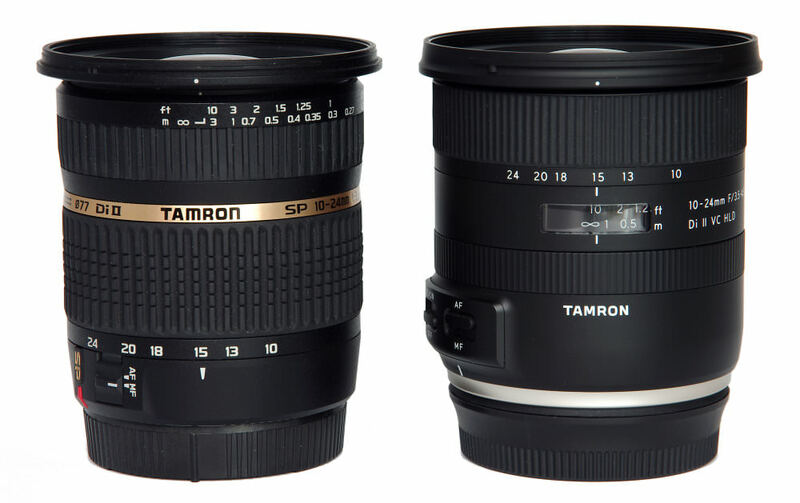 For more options have a look at the Top 5 Best Tamron lenses or Top 15 Wide-angle Landscape Lenses. 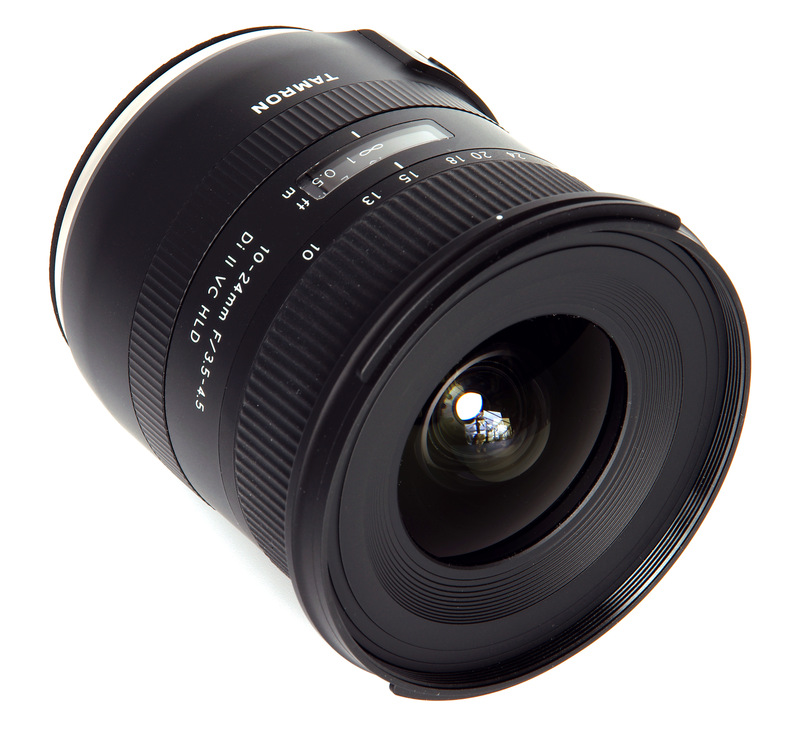 The Tamron 10-24mm f/3.5-4.5 Di II VC HLD Lens is an excellent lens that can be highly recommended. It is designed with the centre of the field very much in mind, so depending on use, it should be possible to enjoy the outstanding sharpness when the main subject is fairly centrally placed. However, it is still possible to have excellent edge sharpness if the aperture used is chosen with that in mind. It is an attractive optic, not only for its sharpness and other optical qualities but also for its smart new design ethos, matching nicely with other new Tamron lenses. Add the moisture resistance and a price competitive with its peers and we have a very useful general purpose wide angle zoom capable of very satisfactory results. 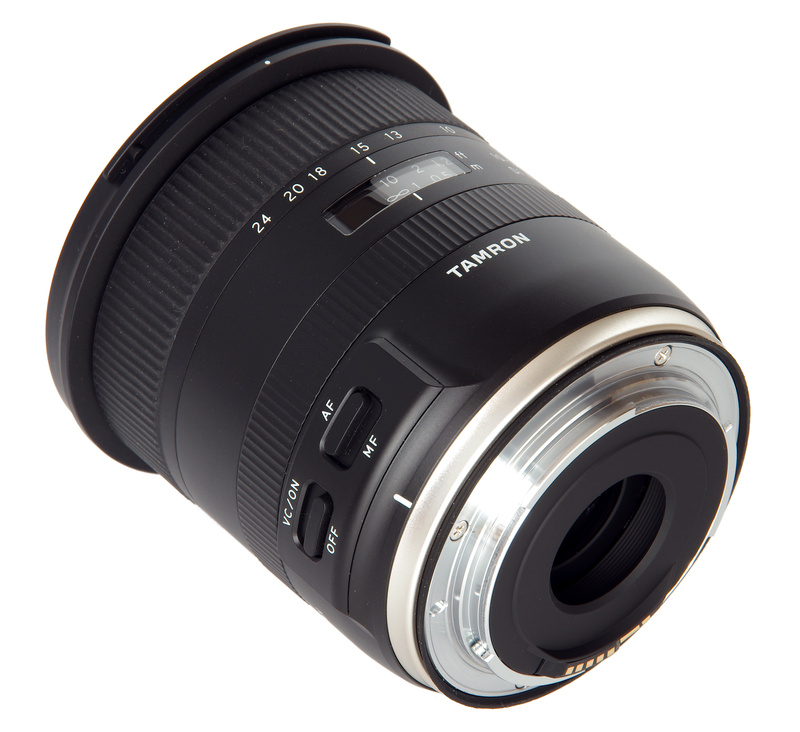 The Tamron 10-24mm f/3.5-4.5 Di II VC HLD is a compact, efficient ultra-wide zoom lens capable of outstanding sharpness. Looks like a drastic improvement over it's predecessor - much nicer IQ even under the dreary looking test conditions. Up there with the best, I'd say. For £579 they need to do a bit better with the edges. After all this is an APS-C format lens not a full frame. I would have liked to see this lens tested on a higher resolution Nikon body, it would be imformative for existing lenses to be retested to compare with this lens. The testing results are now numerical 0-3500 LW/PH where previously they were classed as poor-excellent, excellent could have been 2500 LW/PH the new method is better but not comparable with previous results. 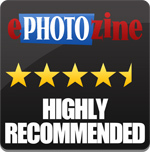 Thanks for reviewing so quickly I am interested in a lens in this group. Not sure why review websites keep ignoring the Tokina 11-20mm f2.8 that replaced the very popular 11-16mm some time ago. Actually, I can probably take a guess that it's due to Tokina's poor marketing and slow distribution. Regardless, surely it's one of the most fitting alternatives to this and a good point for a direct comparison review? Not sure why review websites keep ignoring the Tokina 11-20mm f2.8 that replaced the very popular 11-16mm some time ago. Actually, I can probably take a guess that it's due to Tokina's poor marketing and slow distribution. Regardless, surely it's one of the most fitting alternatives to this and a good point for a direct comparison review? [quote]Not sure why review websites keep ignoring the Tokina 11-20mm f2.8 that replaced the very popular 11-16mm some time ago. Actually, I can probably take a guess that it's due to Tokina's poor marketing and slow distribution. Regardless, surely it's one of the most fitting alternatives to this and a good point for a direct comparison review? [/quote] I agree you can't even get one of the shelf at the larger retailers , allows seems to be order only. Quote:Not sure why review websites keep ignoring the Tokina 11-20mm f2.8 that replaced the very popular 11-16mm some time ago. Actually, I can probably take a guess that it's due to Tokina's poor marketing and slow distribution. I agree you can't even get one of the shelf at the larger retailers , allows seems to be order only. Unfortunately, the very weak corners of this lens render it unusable for my landscape photography. Hence, there is still no solution to going serious about wide angle photography without switching to full frame. Nonetheless, it's a decent lens for hobby photography.